Orval Howard Hinshaw1,3,4,5,6,7 [Orville Howard Hinshaw8]. He married Marguritte S. Coffin1,13 [Margariette S. Coffin4, Margaret Coffin1, Margret Coffin11], Nov 26 19191,13, Indianapolis, Marion County, Indiana1,13. Coffin, Della, head-of-household, age 49, born in Indiana; parents born in Indiana; widow; rented home; occupation: day work, [..unclear..]. 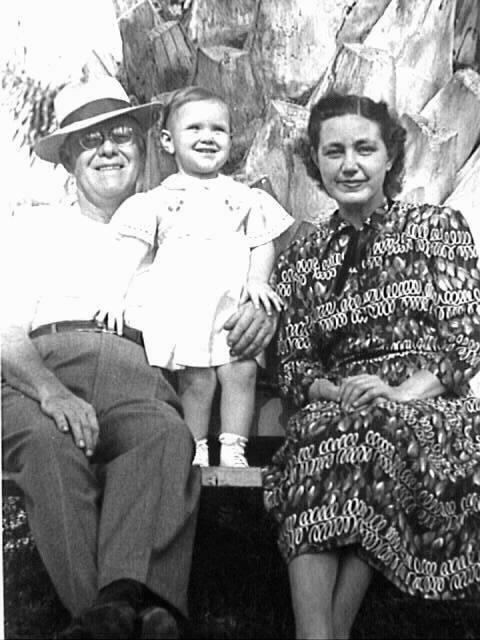 Coffin, Dorothy, daughter, age 14, born in Indiana; parents born in Indiana; attended school. Coffin, William, son, age 12, born in Indiana; parents born in Indiana; attended school. 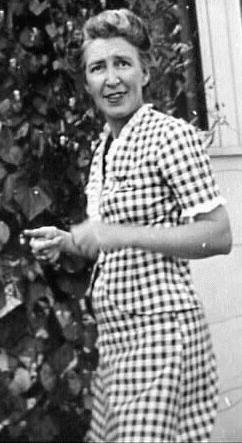 Hinshaw, Margret, daughter, age 16, born in Indiana; parents born in Indiana; occupation: seamstress, tailor shop. 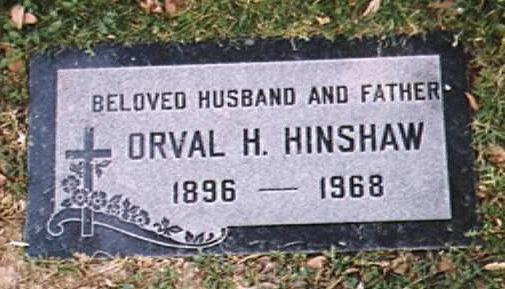 Hinshaw, Orval, son-in-law, age 23, born in Indiana; father born in "western state"; mother born in Indiana; occupation: presser, tailor shop. Hinshaw, Orval H., head-of-household, age 33, born in Indiana; father born in Kansas; mother born in Indiana; first married at age 21; owned home ($2500 value); no radio in home; occupation: pie baker, bakery; World War I veteran. Hinshaw, Ruth M., wife, age 20, born in Indiana; parents born in Indiana; first married at age 17; occupation: pie baker, bakery. Funeral services for Orval Howard Hinshaw Sr., 71, of 13653 Homeward Ave., La Puente formerly of Whittier, will be conducted Monday at 2:30 P.M. in Hillside Church, Rose Hills Memorial Park, with the Rev. Dr. Russell E. Clay officiating. Interment will follow in Rose Hills. Mr. Hinshaw, a resident of this area for 25 years, was born in Indiana, and died Thursday. He was sexton for many years at Whittier First Methodist Church. 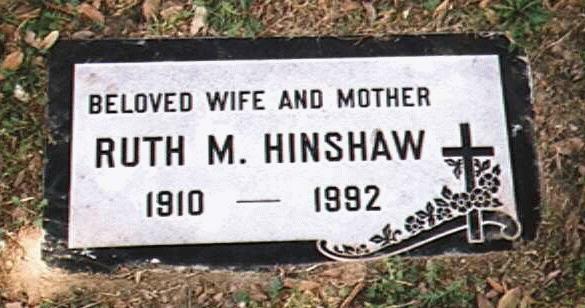 Mr. Hinshaw is survived by his wife, Ruth; three sons, Orville H., Jr., Brea; Richard D. Hinshaw of the home address and William H. Hinshaw, of Whittier; two brothers, Lawrence and Jack Hinshaw of Indiana; a sister, Mrs. Geneva Travelstead of Indiana; and three grandchildren. 1930 census, Indianapolis, Center Township, Marion County, Indiana; roll T626-607, ED 304, page 1A, line #15, dwelling #5, family #5. 1900 census, Anderson, Anderson Township, Madison County, Indiana; roll T623-386, ED 86, page 15B, line #99, dwelling #329, family #339. 1920 census, Indianapolis, Center Township, Marion County, Indiana; roll T625-451, ED 37, page 12A, line #19, dwelling #306, family #327. Marriage certificate for Orval Hinshaw & Margariette S. Coffin. Death certificate for Margariette S. (Coffin) Hinshaw. Divorce papers for Orval Hinshaw & Marguritte S. (Coffin) Hinshaw.